Are you worried you have a problem with your wisdom teeth? Those are the third set of molars many people get in their late teens or early 20s — and when they come in, they don’t feel all that wise. Swelling and discomfort in the back of the mouth are all symptoms of problematic wisdom teeth. In this week’s blog post, your Mt. Holly dentist explains pericoronitis, a condition that occurs around impacted or infected wisdom teeth. Just like the name suggests, peri- (around) coron- (crown) itis is an infection that occurs in the gum around the crown of the tooth — in this case, the wisdom teeth. When the teeth only partially erupt, a flap of gum tissue may be created over the tooth, allowing for the easy entry of food particles and the bacteria from plaque. Left for too long, these substances irritate the gum tissue and lead to infection that can spread to the glands or cheeks. That’s what we call pericoronitis. Be on the lookout for the symptoms of pericoronitis. 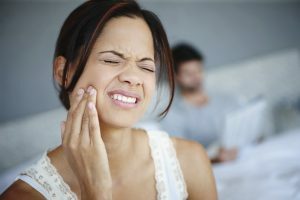 Infected wisdom teeth require prompt treatment (often, but not always, extraction) to prevent the spread of infection. Schedule an appointment at Mt. Holly Family Dentistry as soon as you suspect you have one or more infected wisdom teeth. During your routine checkups and cleanings, your dentist in Mt. Holly will periodically check in on the presence or alignment of your wisdom teeth with an all-digital x-ray. Digital x-rays reduce your exposure to radiation by up to 80%, and also give your dentist a much clearer picture of what’s going on in your mouth. If your wisdom teeth are partially erupted, your dentist will check for swelling, infection, or the presence of a gum flap that could lead to pericoronitis. If the infection is limited to the tooth (meaning it has not spread to the cheek or gland), we may prescribe antibiotic therapy and instruct you to routinely clean beneath the gum flap if possible. Rinsing your mouth with warm salt water can soothe discomfort. If the infection is severe, or if reinfection occurs, your dentist will likely recommend wisdom teeth extraction. At Mt. Holly Family Dentistry, we are pleased to offer our patients comfortable tooth extractions as needed. Our experienced doctors are prepared to handle most extractions, but will not hesitate to refer more advanced cases to local specialists. Aching Wisdom Tooth? Schedule an Appointment Today! Don’t ignore that ache in the back of your jaw for another day. Let us take a look and see if pericoronitis is causing your pain — we’ll provide prompt, effective treatment if so. Schedule an appointment with your dentist today.